HELENA, Mont. (AP) — Montana lawmakers are considering a bill aimed at reducing prescription drug prices for people who buy their health insurance through the marketplace, although companies that sell individual health insurance plans argued Friday it would actually hamper their efforts to negotiate favorable contracts for administration of their prescription benefits. HELENA, Mont. (AP) — Montana lawmakers and the state insurance commissioner are targeting a generally hidden part of the health care system, with new regulations aimed at bringing down prescription drug costs. Companies in the drug supply chain, and the state's biggest health insurance company, are fighting back. BILLINGS, Mont. (AP) — Final numbers show more than $70 million was spent in the U.S. Senate contest between Democratic incumbent Jon Tester and his Trump-backed challenger. Tester secured a third term in the Nov. 6 election, defeating Republican State Auditor Matt Rosendale to cap the most expensive political campaign in Montana history. Including money spent in the June primary bumps the election's total price tag to about $73 million. MISSOULA, Mont. (AP) — Missoula County commissioners have approved a policy to charge organizers of large political campaign events for the cost of additional law enforcement services. The policy approved Wednesday came followed a recent visit by President Donald Trump to campaign on behalf of Republican U.S. Senate candidate Matt Rosendale. The sheriff's department spent nearly $13,000 in providing security. The county sent a bill to Rosendale's campaign, but did not receive a response. HELENA, Mont. (AP) — Democratic Sen. Jon Tester overcame President Donald Trump's personal interest in his defeat to win a third term by holding on to his base and poaching voters who gave Trump a landslide victory in Montana in 2016. BILLINGS, Mont. (AP) — Only U.S. Sen. Jon Tester of Montana survived President Donald Trump's aggressive campaign to topple Democratic senators from Republican-leaning states who voted against his Supreme Court picks. The president and his surrogates returned repeatedly to Montana, North Dakota, Missouri and Indiana this election season, pounding on Tester and other incumbent Democrats who opposed the nominations of Brett Kavanaugh and Neil Gorsuch. Montana Sen. Jon Tester is a rare survivor from President Donald Trump's aggressive campaign to unseat Democrats in Republican-leaning states. The president repeatedly returned to Montana, North Dakota, Missouri and Indiana, where he pounded on Tester and other lawmakers who opposed his Supreme Court picks, Brett Kavanaugh and Neil Gorsuch. Voters casting midterm election ballots in Montana were divided over President Donald Trump's performance, and it showed in the results: Republican Rep. Greg Gianforte embraced the president's agenda and won, but four campaign appearances with Trump failed to help challenger Matt Rosendale unseat Democratic Sen. Jon Tester. Voters casting midterm election ballots in Montana are divided over the state of the nation, according to a wide-ranging survey of the American electorate. As voters cast ballots for U.S. Senate and members of Congress in Tuesday's elections, AP VoteCast found that 48 percent of Montana voters said the country is on the right track, compared with 49 percent who said the country is headed in the wrong direction. As of 3:45 a.m. EST on Wednesday, Rosendale holds a lead of 6,082 votes out of more than 355,000 cast — a margin of roughly 1.7 percent. BILLINGS, Mont. 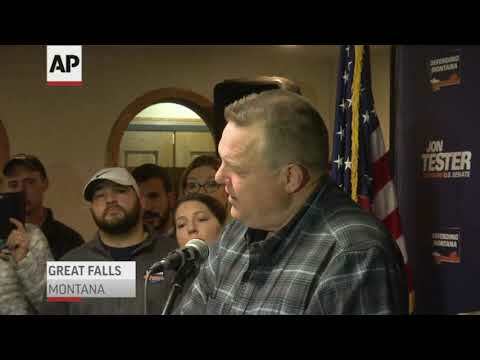 (AP) — Democratic incumbent Jon Tester and Republican Matt Rosendale are locked in a Montana U.S. Senate race that was too close to call Tuesday night with votes still being counted, following a campaign dominated by President Donald Trump's personal push to vanquish Tester. Democratic incumbent Jon Tester and Republican Matt Rosendale are locked in a Montana U.S. Senate race that's too close to call with votes still being counted. Election results were still coming in Tuesday night. Rosendale was following the returns with supporters in Helena, while Tester told his supporters to go home for the night. Tuesday caps an extended 25-day voting period in Montana's midterm elections, with the top race being the battle between Democratic Sen. Jon Tester and Republican challenger Matt Rosendale. Vice President Mike Pence says re-electing Montana U.S. Sen. Jon Tester to a third term would embolden the opposition to President Donald Trump and risk unraveling his accomplishments. Pence told supporters at a Monday rally north of Kalispell to vote for Republican Senate candidate Matt Rosendale as a fiscal conservative who would "stand with the president every day." KALISPELL, Mont. (AP) — Vice President Mike Pence is headlining a rally for State Auditor Matt Rosendale in northwestern Montana as the Republican's bid to unseat Democratic incumbent Sen. Jon Tester barrels toward its conclusion. Meanwhile, Tester is holding rallies in Missoula and Great Falls Monday with House candidate Kathleen Williams. BILLINGS, Mont. (AP) — Candidates for Montana's closely-contested U.S. Senate race face a grim reality as they press toward Tuesday's finish: There's a dwindling pool of voters left after large numbers already cast their ballots before Election Day. BILLINGS, Mont. (AP) — With President Donald Trump clamoring to defeat U.S. Sen. Jon Tester and conservative groups spending heavily against him, the Democrat is falling back on a well-worn strategy in his pursuit of a third term: make the election about Montana, not Washington. KALISPELL, Mont. (AP) — The Montana Republican Party has announced more details about Vice President Mike Pence's get-out-the-vote rally in northwestern Montana. Pence is scheduled to make a campaign stop on behalf of U.S. Senate candidate Matt Rosendale and U.S. Rep. Greg Gianforte at 11:30 a.m. Monday at Glacier Park International Airport just north of Kalispell. KALISPELL, Mont. (AP) — Vice President Mike Pence is making his third trip to Montana during this election cycle to campaign on behalf of Republican U.S. Senate candidate Matt Rosendale. His office said Pence is scheduled to stop in Kalispell on Monday, the day before Election Day. The time and place have not been announced. President Donald Trump and Donald Trump Jr. also have made several appearances to support Rosendale as he seeks to unseat Democratic U.S. Sen. Jon Tester. HELENA, Mont. (AP) — Montana Gov. Steve Bullock is leading a Halloween rally for fellow Democrats U.S. Sen. Jon Tester and House candidate Kathleen Williams in the final days before the midterm elections. BILLINGS, Mont. (AP) — The Libertarian candidate in Montana's U.S. Senate race threw his support behind his Republican opponent Wednesday in a surprise move that came in response to an election mailer from an unknown group that appeared aimed at undermining Rosendale's support among conservatives. The chairman of the Montana Libertarians is disavowing comments from the party's U.S. Senate candidate that support Republican Matt Rosendale. Francis Wendt says the Libertarian Party doesn't support Rosendale because he's from another party and lacks a strong enough stance on privacy issues. HELENA, Mont. (AP) — President Donald Trump is returning to Montana on Saturday to hold an unprecedented fourth rally in support of Republican Senate candidate Matt Rosendale just days before the election, campaign officials said Monday. BOZEMAN, Mont. (AP) — U.S. Sen. Lindsey Graham of South Carolina is scheduled to be in Bozeman this week for a get-out-the-vote rally. The campaign of Republican U.S. Senate candidate Matt Rosendale announced the rally will be held Wednesday afternoon at the Montana Republican Party's office in Bozeman. President Donald Trump's eldest son is calling Sen. Jon Tester "a piece of garbage" for the Montana Democrat's role in sinking the nomination of the president's first choice to head the U.S. Department of Veterans Affairs. HELENA, Mont. (AP) — Republican Senate candidate Matt Rosendale is on an eight-city campaign tour through western Montana with the president's eldest son. The tour launched Friday morning in Bozeman. It's Donald Trump Jr.'s third trip to the state in support of Rosendale's campaign to unseat Democratic Sen. Jon Tester. Trump is traveling with his girlfriend, former Fox News personality Kimberly Guilfoyle. A record-smashing $60 million in campaign donations and outside spending has gone into Montana's contentious U.S. Senate race as Democrats seek to hold on to the seat in a Trump-leaning state. The Associated Press reviewed campaign filings with the Federal Election Commission to tally the money flowing into the contest between Democratic incumbent Jon Tester and Republican Matt Rosendale. HELENA, Mont. (AP) — Donald Trump Jr. and former Fox News personality Kimberly Guilfoyle plan an eight-stop bus tour through Montana this weekend to campaign on behalf of Republican U.S. Senate candidate Matt Rosendale and U.S. Rep. Greg Gianforte. The tour includes Friday stops at Mixers Saloon in Bozeman at 11 a.m., the Copper King hotel in Butte at 2 p.m., Kleffner Ranch in East Helena at 5 p.m. and the former First Interstate Bank branch in the Great Falls Marketplace at 8 p.m.
MISSOULA, Mont. (AP) — President Donald Trump suggested without evidence Thursday that Democrats or their allies are supporting a "caravan" of Central American migrants who are traveling north aiming to enter the United States. Addressing thousands of supporters at a campaign rally in Montana, Trump said immigration is now one of the leading issues in the 2018 midterms, and he accused Democrats of supporting the migrants because they "figure everybody coming in is going to vote Democrat." BILLINGS, Mont. (AP) — Outside groups and individual donors have poured more than $45 million into Montana's U.S. Senate race as President Donald Trump prepares a third trip to the Big Sky state in his crusade to unseat two-term Democratic Sen. Jon Tester. The contest is on pace to be the most expensive in Montana history, and it's been driven by Trump's apparent personal interest in Tester's defeat and his efforts to ensure Republicans keep power in the Senate. HELENA, Mont. (AP) — Surrogates of President Donald Trump are planning a two-day bus tour in Montana to campaign for Republican candidates for U.S. House and Senate. MISSOULA, Mont. (AP) — President Donald Trump's visit to Missoula this week to campaign on behalf of Republican U.S. Senate candidate Matt Rosendale will be held at Missoula International Airport. Trump's campaign initially said the rally would be held at Neptune Aviation Services at 6:30 p.m. Thursday. Organizers decided Monday to moved it to Minuteman Aviation so the president could be photographed speaking in front of Air Force One. HELENA, Mont. (AP) — U.S. Sen. Jon Tester went on the attack Saturday against Republican candidate Matt Rosendale as the Montana Democrat fights to keep his seat in a tightening Senate race. Tester is one of 10 Senate Democrats seeking re-election in states won by President Donald Trump in 2016. HELENA, Mont. (AP) — President Donald Trump is planning a three-state campaign swing in the West in the final weeks before the Nov. 6 election. Trump campaign officials say the president will use the rallies next Thursday, Friday and Saturday to urge people to get out and vote in Montana, Arizona and Nevada. Each of the three western states has tight Senate races. HELENA, Mont. (AP) — A key factor in deciding the outcome of Montana's high-profile Senate race will be whether independent women who voted for Donald Trump in 2016 will stick with the president and Republicans again this year, political observers said. GREAT FALLS, Mont. (AP) — The second debate between Democratic Sen. Jon Tester and Republican challenger Matt Rosendale has been postponed so Tester can be in Washington D.C. for a possible weekend vote on embattled Supreme Court nominee Brett Kavanaugh. Tester's campaign confirmed Thursday that staff are trying to reschedule the debate, which was set to take place in Great Falls on Saturday night. The claim against the two-term incumbent feeds into State Auditor Rosendale's narrative of Tester as hostile to the agenda of President Donald Trump, who won Montana by 20 percentage points in 2016. BOZEMAN, Mont. (AP) — Vice President Mike Pence is criticizing Democratic U.S. Sen. Jon Tester of Montana for announcing his opposition to Supreme Court nominee Brett Kavanaugh before an FBI investigation into the judge is completed. Pence said at a campaign rally Tuesday in Bozeman that Tester is voting against Kavanaugh because Kavanaugh is a conservative. He urged the crowd to vote for Republican Senate candidate Matt Rosendale to help the GOP expand its one-vote Senate majority. BOZEMAN, Mont. (AP) — Vice President Mike Pence is scheduled to speak at a campaign rally for Republican U.S. Senate candidate Matt Rosendale at noon Tuesday at the Gallatin County Fairgrounds in Bozeman. The rally was earlier scheduled to begin at 1 p.m. The doors open at 10 a.m. and attendees must have a ticket . BILLINGS, Mont. (AP) — U.S. Sen. Jon Tester's Republican opponent accused the Montana Democrat on Saturday of slowing the confirmation of Brett Kavanaugh to the Supreme Court and called the judge an "honorable man" who's been "smeared" by sexual assault allegations. GOP candidate Matt Rosendale, the state auditor, faulted Tester for failing to meet with Kavanaugh and blaming it on the White House. HELENA, Mont. (AP) — Montana U.S. Sen. Jon Tester said Friday he'll vote against Brett Kavanaugh's confirmation to the U.S. Supreme Court, removing himself from the short list of undecided Democratic senators who are up for re-election in states won by President Donald Trump.